Maybe you’ve seen a pergola’s sweeping lines and strong, sturdy frame from a distance and had to know more about it. Perhaps a friend or neighbor has a pergola and you’ve been admiring the way it increases their enjoyment of their outdoor spaces and adds an incredibly impactful visual statement to their property. Now you’ve decided that you want a pergola of your own but are stuck on deciding if you want to purchase a prefab pergola kit or build your own. Here are some pros and cons of each. Pros: All the cutting — including notching — is done for you. Everything — from the smallest screw to the largest board — is shipped directly to your location. All you need to do is grab a few buddies, unbox it and start building. Because all the prep work is done for you, it’s usually a quick job to put a pergola together from a prefab kit. In many cases — depending on its size — a pergola from a prefab kit can be assembled and be ready for use in a weekend or less. A prefab kit has been designed by teams of experts that have years of experience in the field. 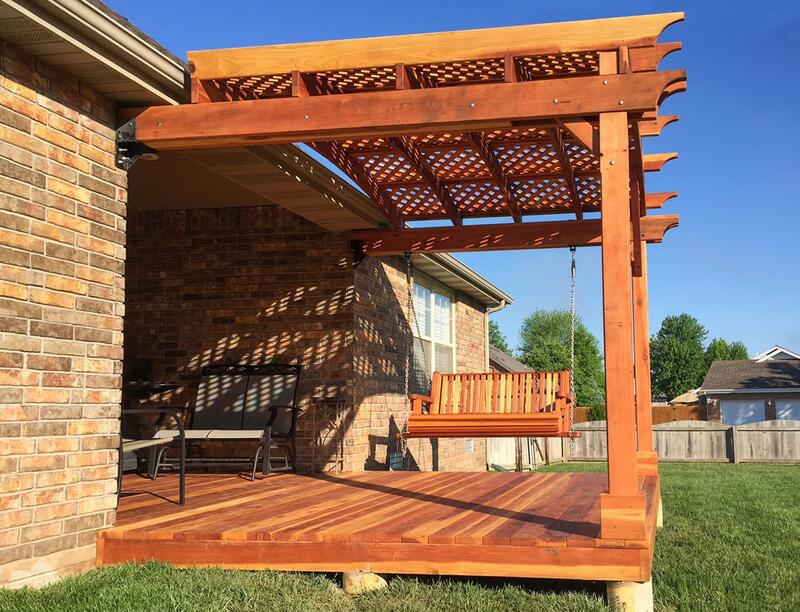 Using the latest in design and research, these engineers craft beautiful pergola plans that are designed to meet your need for a practical and awe-inspiring patio, poolside area or backyard. Because these plans are designed by engineers who have the training and education to create viable blueprints and instructions, you know that these prefab pergola kits will deliver you the results you expect. Cons: Sometimes — but not always — prefab kits can be more expensive than building your own pergola. In many cases, though, by the time you source the materials, carefully compare costs at several locations to ensure that you’re getting the best price and drive to pick them up — or pay to have them delivered — it’s likely that you have spent a great more time and money than you thought you would. This makes your potential savings negligible at best and could even end up costing you more in the long run. While a prefab pergola kit is designed by expert engineers, it is still someone else’s design. As such, it might not fit precisely into your particular parameters and check all the boxes you had hoped for. Pros: When you build your own pergola without using a prefab kit, you are truly on your own. This can be a liberating experience since it allows you to design a pergola that is unique and suits all your needs. You can also decide which type of wood and hardware that you want to use for your pergola. While some pergola kits allow you to choose the wood or hardware that you receive, in most cases you’ll be limited to those that the company has found to work best. Cons: The same things that make building your own pergola from scratch appealing are those that make it challenging as well. While you have creative freedom to choose the design you want to use when you do it yourself, you need to make sure that it’s a viable plan. Obtaining a plan for a pergola from a random site online is a hit or miss option that could provide you with less than ideal results. In addition, if you run into issues during the build process, you are pretty much on your own or at the mercy of whomever is online and willing to help you. A prefab pergola kit comes with a warranty as well as customer support. Not only do they believe in the quality of their plans and materials, a company that offers Redwood pergola kits wants to see you succeed and provides the resources to help you do so. Forever Redwood provides gorgeous prefab pergola kits that are expertly designed and crafted from reclaimed wood from the mighty Redwood forests. Available in a number of attractive styles, their quality and customer service are unsurpassed. Reach out today and learn more about what offers will fit your needs.